It’s time for another ScrapMuch? Sketch-y Friday Team A reveal! Today I’m sharing a layout that features the super hot Simple Stories I Am line. When I saw the reveal on this line I couldn’t wait to play with it and I was super thankful to find a bunch of it at ScrapMuch?! I know I probably shouldn’t be adding to my stash but this was so so so worth it (and I only bought a little bit!)! This post comes with a bit of a warning, it’s not just about a layout. It’s about me. It’s about sharing. It’s about real life and being true. The picture is a selfie from an absolute moment of zen and relaxation. I snapped it on my mid-winter escape to Vegas when I was lying on a beach chair in the warm sun and finally able to just relax from all the stresses and emotional events that preceded that trip. I was So. Happy. The squares on the side truly are perfectly me – feeling happy, feeling blessed, and there’s tons of photographic evidence of me being happy in the sun. I fussy cut the feathers from some of the other pages, as well as the flower. I used the black and white striped paper in the corner after I cut my pennant, just because I liked how it looked up there. I used that great portion of word paper and intentionally left some parts visible. I am enjoying the journey. I am on a journey. I really struggle with the last two. “I am enough” was a mantra I was learning and starting to believe when I was routinely doing yoga with time spent on pranayama. It was finally quieting the voices of inadequacy that rambled in my head. My final thoughts on “I am beautiful” are far too heady for this post and for right now, but suffice to say it’s something I hope to feel and believe, truly believe, in my lifetime. That is a universal woman sentiment. We all want to feel beautiful. And now it’s your turn! Hop on over to the ScrapMuch? blog and see what the rest of the team has created for your inspiration this week. 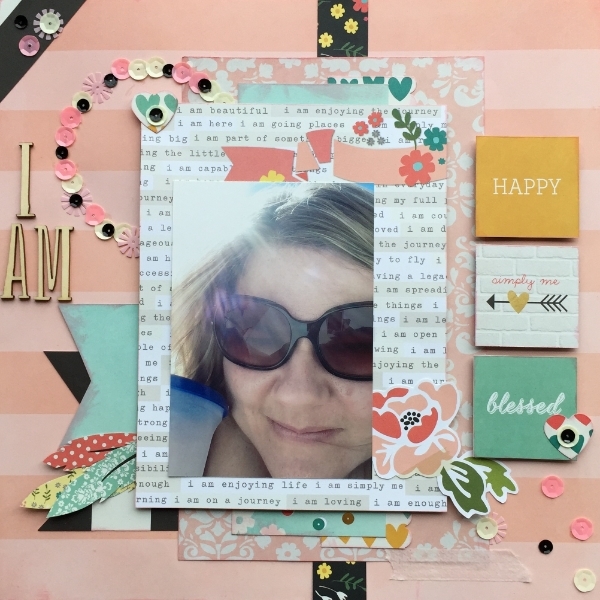 Then create your own layout and link up with us for a chance to win a fabulous ScrapMuch? prize! As always, I can’t wait to see what you create! It’s the first Friday of the month which means ScrapMuch? Team A is up with their double page layout! I recently got this awesome October Afternoon bundle that I couldn’t wait to use on a few pages. 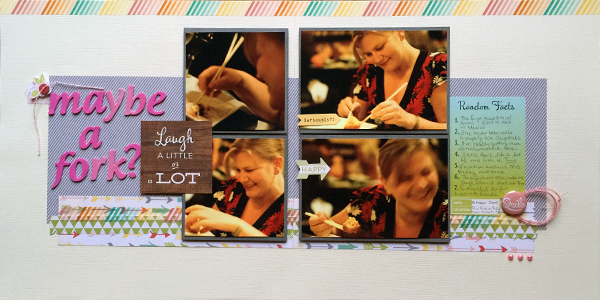 I also managed to use this layout to scrapbook some older photos of a super fun night while away on vacation with friends. I even added in one photo that came out blurry but still captured the joy and laughter that it was too priceless not to scrap (or at least I think so!). Needless to say, I wasn’t very good with chopsticks at the time. I’m thankfully better, but not super proficient. The ombre effect on the thickers was again the result of some inadvertent sun bleaching – but totally works with the washi tape from the line and the ombre journalling tag. And the paper line in general? Nothing but happy, which was totally perfect for the happy photos. So now it’s your turn! Hop on over to the ScrapMuch? blog to see what the rest of the team is up to! Then scrap your take on the sketch and share with us before the end of the month for a chance to win an awesome ScrapMuch? prize! Have a great weekend everyone! Thanks for stopping by!